Bill Goodwin:"Well I had an accident, a terrible accident. This girl might be dying. I gotta get her to a hospital." Bill Goodwin:"Yeah. Oh it was terrible George. Wasn't it Miss Jones?" Gracie:"There was one poor little boy sitting all by himself, and he looked so sad. So I brought him around and made everybody shake hands with him." George:"And that made him feel better?" Gracie:"Well he almost forgot he had the measeles." Gracie:"I just said to my husband this morning, 'if they don't do something to cut down the high cost of living, we'll just have to get along without it'." Gracie:"And he said to me, 'Well Gracie, here's to your health. Let's drink, bottoms up'." Gracie:"Well, isn't that kind of an awkward position?" 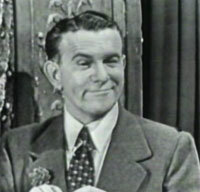 Gracie:"Well George Burns! I'm so mad at you, I don't think I'll ever talk to you again!" George:"I'll tell ya something about plot, but don't tell this to Ed Sullivan or Eddie Cantor. It's cheaper then guest stars." Gracie:"But the minute I got into the doctor's office, I knew he was no good." George:"You knew he was a bad doctor?" Gracie:"Yeah, all his patients were sick." Tax Man:"Are you Mrs. Burns?" Gracie:"Yes, Mr. Burns is much taller." Gracie:"Nobody is going to ride in the car!" Gracie:"Why sure! Everyday you read about some car hitting a pedestrian. We're gonna walk."